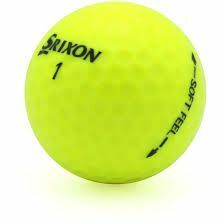 The Srixon Soft Feel golf ball has been engineered to benefit golfers of all swing speeds. The resilient rabalon-elastomer cover includes a “Hit Straight” alignment aid and a newly developed 328 dimple pattern for high lift and great control. The energetic gradient growth core provides explosive power on tee shots to gain higher initial velocity.